Stowe Arena: 350 Park Street, Stowe | Destination Recreation | Kids VT - small people, big ideas! The first snowfall of the season always gets my family fired up for winter sports. When winter's in full swing, we're avid downhill skiers. 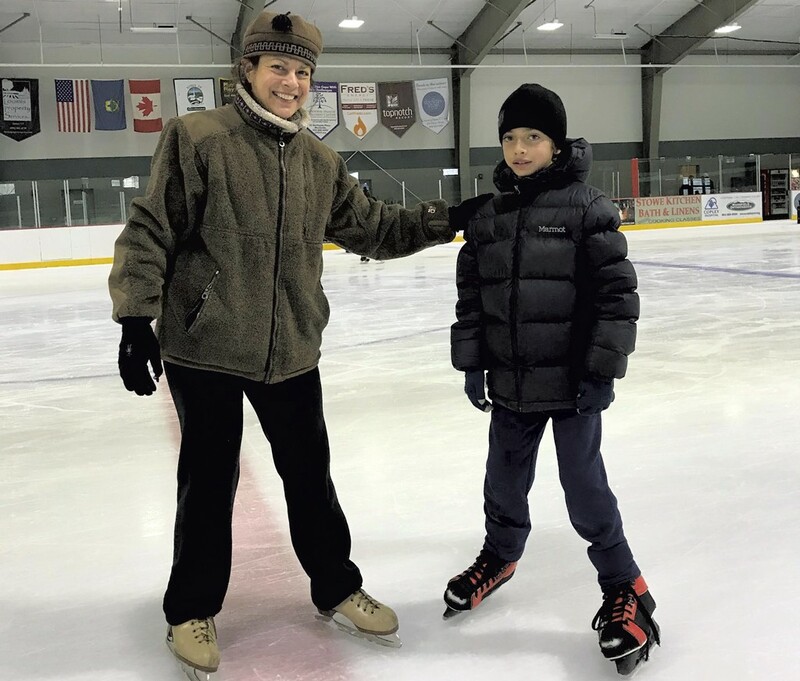 But on a November Sunday — with just a dusting of powder on the ground — indoor ice-skating was the perfect cold-weather activity for me and my 9-year-old son, Zac. I browsed local indoor skating rinks online and noticed that ice times fluctuate from day to day. Stowe Arena had a window of time for public skating that worked for us. I called to verify the online schedule before we headed out. The indoor arena, adjacent to Stowe Elementary School and the town library, is housed in a complex with other recreational facilities, including an outdoor basketball court, baseball field and playground. We paid $20 total for our entry fee and skate rentals, then headed into the rink. Public skating times are often brief, sandwiched between hockey sessions. Because we arrived after the start time of this session, we had just an hour to play on the ice. The rental skates were well worn, but sharp enough for amateur gliding. We laced up and waddled onto the ice. About 20 people circumnavigated the rink, including toddlers, school-aged children, teens and adults. Piped-in classic rock provided a rhythmic soundtrack. I've skated only a handful of times in the past few years, so I was a bit unsteady on my blades at first. But it didn't take long for my muscle memory from childhood figure-skating lessons to kick in. Zac was hesitant, so I grabbed a milk crate from the stack outside the rink to help him balance. Before long, he felt confident enough to ditch the crate in favor of the railing on the rink's outer wall, shuffling along as I coached and encouraged him. He soon let go of the railing completely and skated away from the wall. It was a giant leap from our first skating experience when Zac was 6 and had to skate holding onto a chair and fell repeatedly. A few years had made a world of difference. By the time the staff announced that public skating was over, we were both making small circles in the center of the rink, laughing and taking selfies. As we left, we noticed kids with sticks and pucks eagerly waiting to get on the ice. Après-skate, Zac and I shared a bag of popcorn from the snack bar and watched the Zamboni resurface the ice, turning rough tracks into a gleaming, smooth surface once again. Stowe Arena hosts public skating most days, but times vary. Check the arena's website (stowerec.org) for an updated schedule or call 802-253-6148. Dress in layers and wear thermal socks and gloves. Bring your own helmet or rent one for $2 at the arena. The snack bar offers sandwiches, fries, cookies and beverages. On Saturday, December 16, from 12:15 to 2:15 p.m., kids can skate with Santa Claus and enjoy hot cocoa and candy canes for the same price as regular public skating. Gordon H. Paquette Ice Arena at Leddy Park in Burlington's New North End offers public skating lessons. Leddy also offers drop-in Itty Bitty Skating for preschoolers on Mondays and Thursdays from 10-11:30 a.m. through March 29 for $8 per family. Cairns Arena in South Burlington has public skating most days of the week through March. Essex Skating Facility in Essex Junction offers public rink times as posted on its online calendar. B.O.R. Ice Arena in Barre offers numerous public skating opportunities on weekend afternoons and several weekday evenings. Highgate Sports Arena offers public skating every Sunday from 2:30 p.m. to 4:15 p.m. through March 20. Fenton W. Chester Arena in Lyndon Center has Wednesday and Sunday open skate times through March. Memorial Sports Center in Middlebury offers free skating sessions for children 5 and under. Central Vermont Memorial Civic Center in Montpelier hosts several public skating times in January and February. Castleton College's Spartan Arena in Rutland offers a handful of dates for public skating in December and January.